The focus of this year’s November talks is housing. 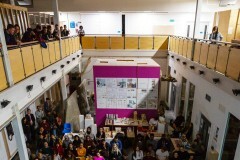 The first of the four speakers to be talking on this topic, at UEL School of Architecture, was Joe Morris, founder and director of London-based practice Morris + Company. Morris + Company launched in 2018 and is an evolution of the practice Duggan-Morris Architects, which Morris co-founded in 2004. The practice has grown steadily, throughout a challenging economic climate, and now has 50 members, along with a new base in Copenhagen. The majority of the practice’s work is within the UK and its projects include the striking, and award-winning R7 Building in London’s King’s Cross. 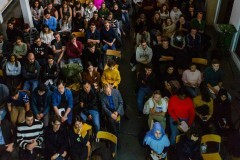 Morris has lectured in Barcelona and Copenhagen, alongside The Bartlett in London, where he also studied. In this lecture, Morris presented housing projects from the practice portfolio, to explore what it looks like to be building housing in London today. These projects ranged from bespoke family homes, through to large and medium scale private housing projects. They included third-age housing, specialist retirement homes, affordable housing, and low-cost co-housing. 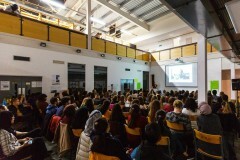 Morris introduced the lecture by offering an insight into the culture of the practice, which also works across the community and workplace sectors. Morris + Company is a close-knit family, with a collegiate way of working, and regularly invites other practices in to share learning. The practice is exploratory, using craft to drive innovation and the design process, and utilising extensive model making to problem solve, and generate ideas about space and light. It is constantly thinking about process, and reflecting on the history of architecture and the history of London in order to innovate. The first project Morris presented was the family home he designed and lived in, in Kings Grove, Peckham. The house utilises previously disused industrial land between suburban terraces, and was built under a drive by local government to occupy such backspaces. 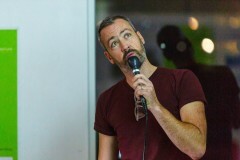 In this context, Morris highlighted the importance of territories, and the thresholds between public and private space. Morris went on to describe working directly with an end user, and the importance of gaining an intimate understanding of the minutiae of someone’s lifestyle, in order to design them a home. He described balanced this insight with an understanding of the context of the home and the neighbourhood it occupies. Morris moved on from bespoke individual houses to look in depth at 11 of the practices’ multiple housing projects, progressing in scale from mews houses, through to mansion blocks, right up to the design of a 220-home podium for London’s Greenwich Peninsula. For each project he presented, Morris talked the audience through the practices’ approach, through from the exploration of purpose, and engagement with context, through to the meticulous considerations around materiality and construction. He shared photographs, and detailed working drawings and diagrams that illustrated extensive experiments with typologies, to generate solutions to complex sites and developer specifications. For example, creating a flexible living space for families within an allocated 16sq2 space for a low-cost, co-housing project. Alongside this insight into the workings of the studio, Morris discussed the extensive conversations and negotiations involved, when getting housing projects in London off the ground. He gave examples of working on housing projects within the strict parameters of a master plan, working on a brief alongside partner practices, and having to sell in a design to developers, planning bodies and action groups, in complex and controversial political contexts. For each project Morris also detailed the considerations given to context and environment, explaining how each building borrows from its surrounds. This included one project built in close proximity to a Grade II listed Arts and Crafts building, amongst ancient woodland, that drew from both in order to deliver contextual, contemporary housing. 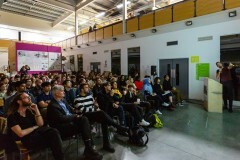 The recurring theme of the talk was on finding the right creative response to marry the importance of human experience with the economic and political context in which housing in London is realised.